Monday, Nov. 12th I performed my one man show Public Speaking at The Magnet Theater! 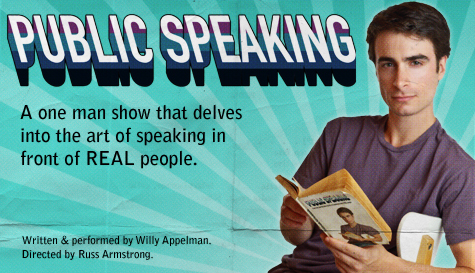 The show consisted of a series of characters dealing with speaking publicly in one way or another. Directed by Russ Armstrong, written and performed by myself, this was an incredibly difficult and rewarding pursuit. Working with Russ was pointed and productive, I was lucky he was on board. Thank you to everyone for the overwhelming response and positive feedback. Looking forward to more performances! Stay Tuned!